Airside project a specially commissioned show in the discotech all night. These guys combine live instruments and electronics to produce genre-defying dance music. Noise of Art at Tate Britain, tonight, 6pm until 10pm. All events free. Access maybe restricted if gallery reaches full capacity. 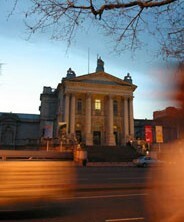 For more information, go to the Tate Britain website here.